The Itty Bitty Kitty Committee: Please Trimbles, Don't Take Down our Tree. Please Trimbles, Don't Take Down our Tree. As soon as they're done eating their breakfast, the Trimbles will be released from quarantine and allowed to meet Bean and roam freely around the main floor of our house. Our Christmas tree is up now. I am hoping that once they're released, they'll be so distracted by all the other new things in their expanded world that the tree won't be too much of a novelty for them. We will see. Last year the Bartlets were here when the tree was up. The previous year we had the Finch brothers. All were pretty good about staying out of it, and mostly played under the tree in the skirt and around all the packages. Our first Christmas with kittens we had the Bouviers and they were completely obsessed with the tree. We spent the better part of our days fishing them out of it. Perhaps you recall THIS post. I hear rumbling in the kitten room right now, so it sounds like their done eating. I've got the camera ready, so I'll be documenting it all. Are you ready Bean? Are you ready Tree? Wish us luck, friends. Good luck! I don't know whether to hope for angelic or naughty behavior... either way, I can't wait to see the pictures. A lovely tree, beautiful decorations and a sleeping Bean . . . I think things are about to change. Good luck with the tree - I had to go a small table top one cause the cats just couldn't resist. Looking forward to seeing the pictures. My kitties are 2 and 3 years old respectively, and they STILL love the Christmas tree. Maybe I should cut back on the glitter ornaments? Laurie, that pose of Bean's is *exactly* why I started to love cats. The ability to sleep in utmost comfort, anywhere, is truly admirable! Nice to see Charlene catching one last bit of rest before her newest class convenes! Oh the temptation ~ it's almost too much for a teeny kitten to resist! LOL! Oh my goodness...good luck lol. That's really funny. And I never saw the Bouvier pics...I'm just giggling now. I have to put my tree up. It's a ceramic and uses a light bulb to work. So far the cats haven't paid much attention to it. But I only had it up last year. I hope the Bean's prediction comes true and that things do get interesting. But in a good way. Been a while since I've had kitten antics around the tree. My sweet little old lady kitty always thought the tree stand made the best watering dish ever. And I've given up making the tree skirt presentable since old man cat rolls himself into a toasty bed in it every year. Good luck with the Trimble Tree! When my Sheba was a kitten, she didn't even wait until I had the tree UP to climb all in it. We brought the tree in, laid it on the floor, and let the cats investigate for an hour or so before we stood it up. (Still wrapped, so no harm done to the tree.) When the investigation finished, we stood it up and started screwing it into the stand. I had about three of the eight screws in when my dad (who was holding the tree) called out, "Careful down there, your tree has an occupant." Sure enough, it shook and several needles rained down on me. I get out and there she is, about 2/3 of the way up the tree, staring at me with bright amber-green eyes. Unfortunately, we couldn't get pictures - Sheba's not a very big cat and she's all black against a dark fir with limited lighting, so we didn't get any good enough to share, but the moment was priceless. Oh how I would love to be a fly on the wall to witness the Trimble kitten emergence! Can't wait for photos!! What a beautiful tree! Will you post a close up pic of it? We are wondering what is going to happen when we put up our tree. I'm sure Geraldine and Phoebe will think it is their new toy! They did get a wonderful wool hand knitted catnip mouse from my trip to Winterfest this weekend. It's amazing how some cats are drawn to the Christmas tree when others aren't. I can't wait to see the Trimbles' reactions to everything!! Laurie, the tree and decorations are gorgeous! I am sure your whole house is done up beautifully for the holidays - would you consider giving us a photo tour -from a kitten's-eye view, perhaps? Can't wait to see the Charlene-meets-the-kittens pictures! How long do you quarantine new kittens from Bean? We will be looking to adopt a couple new shelter kitties sometime soon, but don't want our older kitty to catch any horrible diseases. Good luck with the kittens and the tree, lol! Pearla and Sheldon aren't getting a tree this year.. frankly I am going to be traveling too much and I just KNOW that they will LIVE in it. And chew on the cords. They LOVE cords. Maybe next year? Poor kittens... maybe I will buy them some fun lights or something to stare at. Pam, It's usually 14 days, but it's extended if they're showing symptoms of anything. Hooks on both walls, two wires from tree to hook. It helps ;-). Works on cats and toddlers...and I had both! I never get tired of that tree post. I think Lottie was one of my favorite IBKC kittens ever. Really beautiful tree. 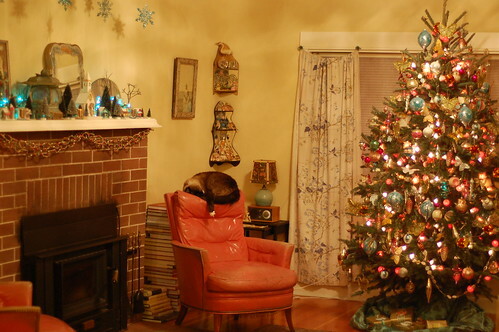 It is awesome how some cats are drawn to the Christmas tree when others aren't. What a Wonderful tree. It is really great that the cats drawn to Christmas tree when others aren't. Really so beautiful tree. It is great that how cats are drawn. Keep sharing such innovative things.